Haresh Sharma is having a bit of a moment. 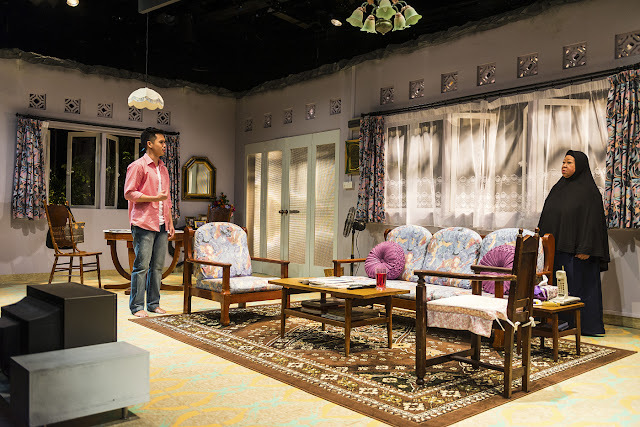 As part of The Neccessary Stage's 30th anniversary season, we've seen a brand new Mandarin monologue, Actor, Forty, and a rip-roaring revival of his early play Those, Who Can't Teach. In June, his body of work as a whole gets a rich, meta-theatrical airing. 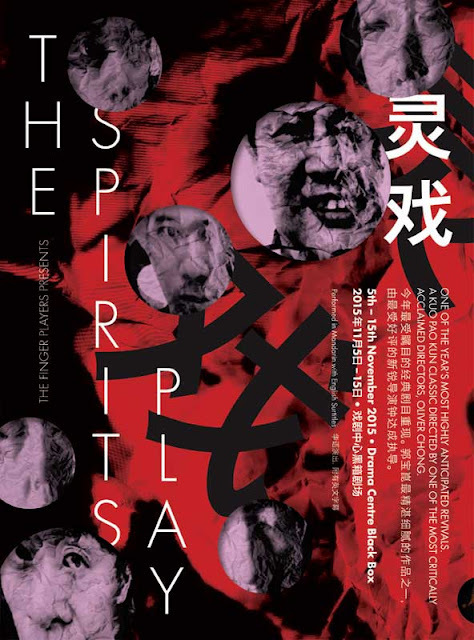 Now the Esplanade Studios team has put together an entire season of plays dedicated to the award-winning playwright and Cultural Medallion recipient, each involving a different theatre maker taking on and giving their unique stamp to one of his plays. 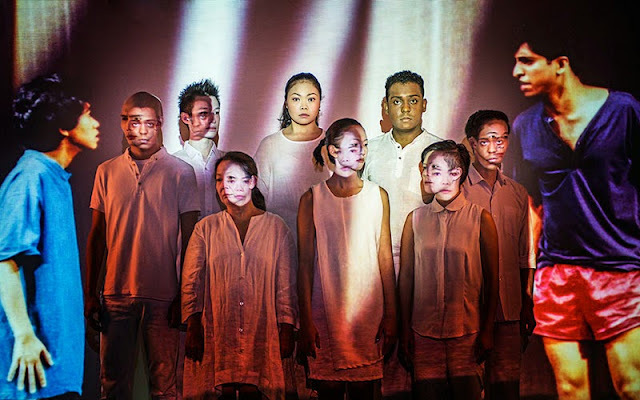 Kicking things off is a Mandarin version of Sharma's critically acclaimed 2006 play Fundamentally Happy, directed and translated by Nelson Chia of Nine Years Theatre. From the outset, we are lured into a false sense of security. The first thing we see is Wong Chee Wai's meticulous, fully-realized set, complete with windows thrown open to lush vegetation and pouring rain. 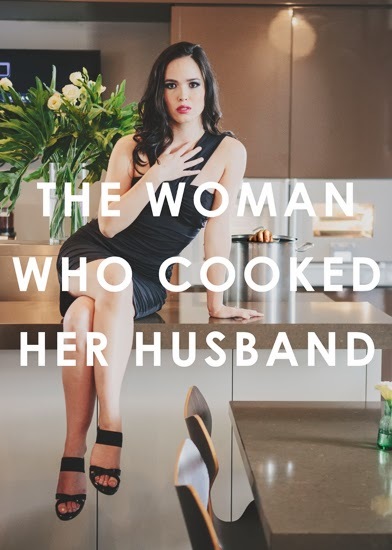 Everything about the scene conjures up a picture of easy domesticity, from the dining table piled with jars of snacks to the cosy collection of books and DVDs. Into this picture tumble two characters who unleash a maelstrom of emotions from which neither can recover. Habiba (Lok Meng Chue), a Chinese Muslim convert and madrasah teacher, is visited by her former neighbour Eric (Timothy Wan), a social worker now living in Australia. He wants to reconnect with the couple who had taken care of him during his childhood and she's delighted to see her surrogate son after an absence of twenty years. The warm conversation gradually gives way to something much darker: Eric is revealed to be the victim of sexual abuse at the hands of Ismail, Habiba's husband, and is here to gain closure from this harrowing episode. Sharma's exploration of paedophilia unfolds slowly but remains clothed in shades of grey. As much as we may condemn the actions of the unseen Ismail for preying on an innocent child, we are reminded that he is essentially a good father and husband. Is Habiba as much to blame for being aware of what had been going on but turning a blind eye to it? Or is Eric, who admits that he has spent years yearning for his aggressor, equally culpable? In one of the play's most poignant moments, Habiba suggests that it is Eric who had in fact seduced her husband on the living room carpet all those years ago with his tight shorts and childish hero worship. It's a statement that smacks of desperation and a deep, irrational desire to see things in the best light despite all facts pointing to the opposite. As she herself puts it, he is Satan but he is also a good man. How does a feeling that is "positive" ultimately become "negative"? What are the appropriate values to be placed on the basic human desire to connect with another person? Sharma does not give us easy answers and this deliberate ambivalence makes the play both fascinating and flawed. Justice is ultimately served on the perpetrator of the crime but one gets the sense that these characters will be haunted by their internal demons long after they leave the stage. The bereft Habiba turns to her religion, seeking absolution through a pilgrimage. Eric, meanwhile, heads back into a loveless relationship. While Sharma's text unfolds cleanly on the page, Chia's unevenly paced production leaves a lot to be desired. The first scene is beautifully taut, leaving us with just a frisson of unease at the potential skeletons in the closet. I was struck by the image of Habiba switching from Malay to Chinese songs on her stereo, suggesting a clash of cultures that she continually has to navigate. Yet, the laboured scene transitions - featuring policemen and, later, movers - wear the narrative down. By the time we move into the third act, the pregnant pauses make for tedious viewing and the momentum of the play is all but lost. The two actors also fail to reach the depths of emotion that this play demands. 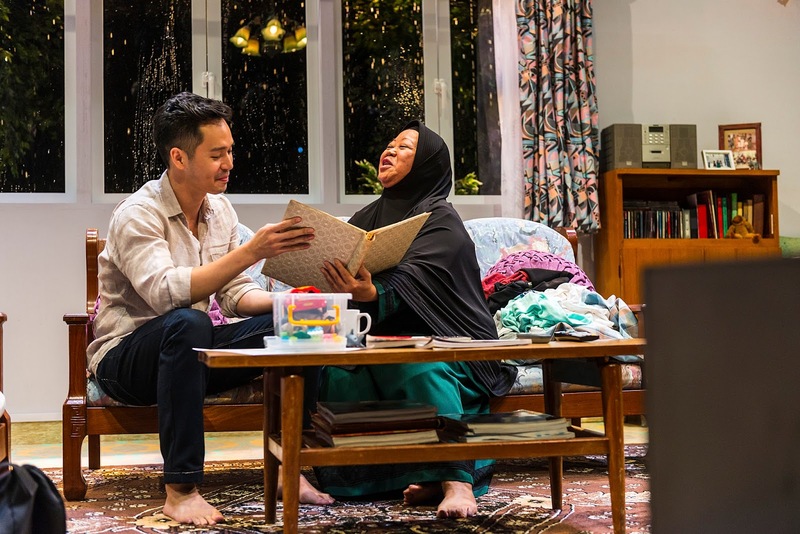 Lok does an adequate job as the motherly Habiba but is ultimately unconvincing with her superficial bits of Malay dialogue. Wan plays the role of Eric a little too tentatively and doesn't hit the high notes of moral outrage and emotional confusion at the situation. When accused of tempting Ismail towards his transgressions, he dissolves into a teary indignation that seems entirely at odds with his previously steadfast demeanour. One gets the sense that the Mandarin dialogue has done little to improve the narrative. There is a quiet musicality to Sharma's text which allows for a linguistic clash between the articulate, university-educated Eric and the Singlish-speaking Habiba whose simple sentences have a strong emotive force. Here, both Wan and Lok speak a middlebrow Mandarin that diminishes these socio-cultural contrasts. Looking at the original text which is preserved for the surtitles, one cannot escape the fact that nuances of the dialogue are being missed. On a final note, I am rather perplexed as to why Chia chooses to excise one of the most arresting moments of the play which occurs, wordlessly, at the very end: Habiba handing Eric the carpet on which all the unspeakable acts took place and him choosing not to take the gift. This symbol of the pain that neither party wishes to carry with them would have served as a powerful final image. Instead, Chia opts for a protracted interlude with Habiba pottering around and listening to music that echoes the opening montage. 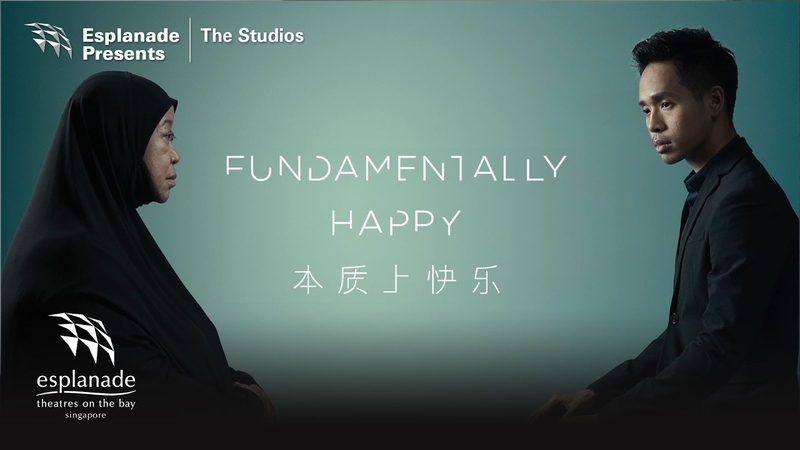 Fundamentally Happy is as much a play about the pleasures and pitfalls of love as it is a searing reminder that there is no single definition of happiness. It paints an eloquent and deeply discomfiting picture and leaves it up to us to make sense of its uncertain brushstrokes. Hi Naeem, thank you for sharing your thoughts on the play, they are important in helping us understand what worked or not in staging and how to improve on it. However, may I enquire if you have a good or reasonable command of Mandarin? I'm curious because of your comment that the two characters spoke "Middlebrow Mandarin". If you listen carefully, you may notice that Habiba used words that are simpler and less accurate as compared to Eric - E.g. When she referred to the reforms that Madrasah wants to make, she used the Chinese word for "change" while Eric used the proper word "reform". Also, the Mandarin translation kept to the fact that Habiba will sometimes end her statements with "this and that", while Eric tended to speak full sentences and used rather academic terms when referring to the issues of abuse. In my humble opinion, it may be more credible to compare the Mandarin translation with the English text and claimed that nuances are lost if you do in fact have a reasonable command of both languages. Otherwise, it may come across as too sweeping? What do you think? PS: by the way, I think the more common spelling of the Islam religious school is "Madrasah" instead of "Madrasash" (as it appeared in your review), unless I'm not aware it has alternative spelling? I really have to apologize because this comment somehow went under my radar for months and I've only just seen it. Thank you so much for stopping by and sharing your thoughts. I do not speak Mandarin and I have to admit that the 'middlebrow' comment was based on a conversation I had with another Mandarin-speaking friend who watched the play with me and my own very general aural observation of the show. Because I was looking at the surtitles (and am familiar with the original play), I found the contrast a lot stronger in Haresh Sharma's English text compared to the Mandarin translation where the characters seemed on an equal footing on the communication front. However, I appreciate you pointing out that you have specifically used simpler, less polished words for the character of Habiba compared to Eric. I was genuinely not aware of this and see how this was an unfair generalization on my part. I agree it would be great to be conversant in both languages to fully appreciate such adaptations. I have also corrected the typo in the word 'madrasah'. It's definitely not an alternative spelling! Thanks again and keep up the great work in the theatre.